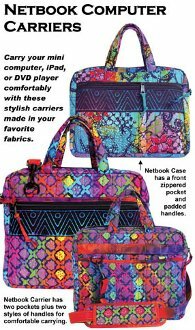 Carry your netbook computer comfortably with these stylish carriers made in your favorite fabrics and colors. Easy-to-follow instructions take you step-by-step through the process of quilting, cutting, marking and sewing. The 8½” H x 11”W x 2”D Netbook Case has a zippered closure and an outside zippered pocket. Padded handles make it easy to carry yet compact enough to fit into a backpack or other bag. The 9½”H x 11½”W x 2½”D Netbook Carrier has a zippered closure and two styles of handles, including an detachable, adjustable strap (with pad) for comfortable cross-body carrying. A special back strap enables the carrier to be safely hooked over the handles of a rolling suitcase. Two outside pockets (one zippered) provide convenient and safe storage for extra gear. Annie prefers to use 100% polyester ByAnnie's Soft and Stable in place of batting in these accessories. Not only is the Soft and Stable very lightweight, but it holds its shape very nicely and really makes a professional looking product.